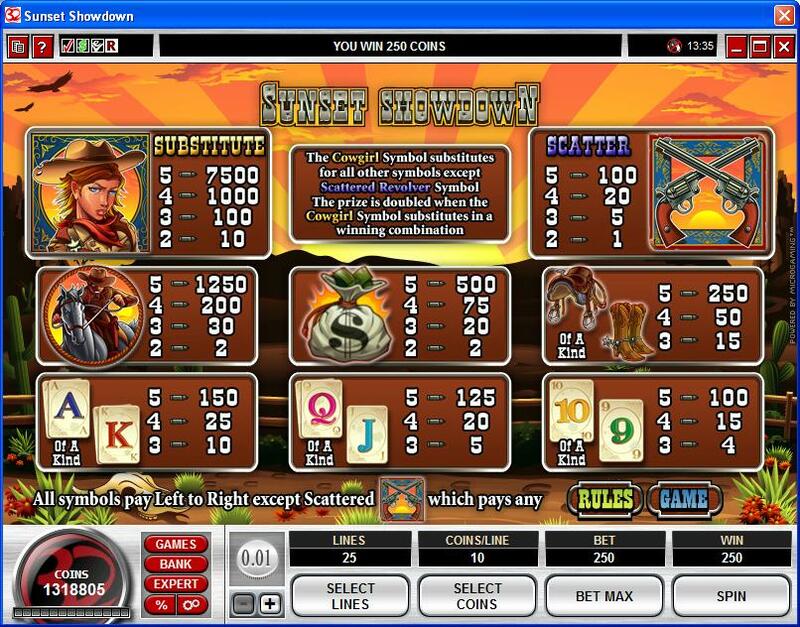 Sunset Showdown is a Wild West inspired game from Microgaming. The theme is one that a lot of players enjoy seeing in games, but the great thing here is that you get a great design as well to go with it. You even get a chance to shoot some bad guys, in a classic showdown, taking place in a dusty town from the Wild West. You’re going to find plenty of other slots with a similar theme out there, but I believe that Sunset Showdown can sit alongside any of them. What is truly rare here is the fact that the hero is actually a lady, a Cowgirl, while men seem to take the main role in pretty much all these games. 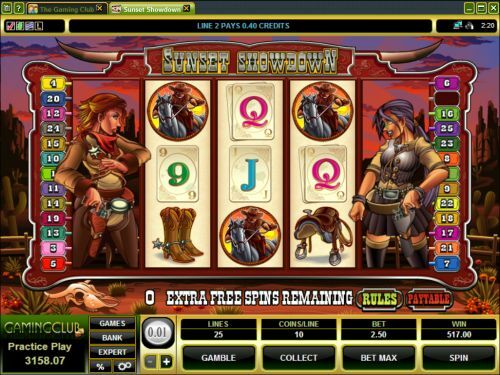 The graphics are great, the 5 reels have 25 bet lines and the features include things like a Baddy bonus game, a round with free spins and expanding wilds, scatters and regular wild symbols. As for the jackpot, it’s at $18,750. You will discover both regular features and some that are far from common. Wilds and scatter symbols are there, as are multipliers and a bonus game. 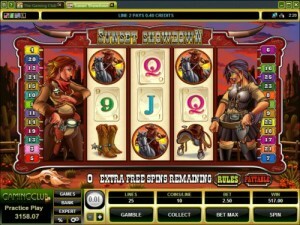 The surprising part is called Extra Free Spin, where you get expanding wilds and free spins for the remaining reels. The Cowgirl is dressed in classic Wild West clothing, with a hat on her head, with a handkerchief around the neck and dressed in dusty brown clothes. The image which shows us the Cowgirl is also the one selected to act as the wild. Since it’s a wild, it can substitute for all other symbols, with the exception of the Revolver scatter. You get twice the usual prize when the wild helps you out with its substitution ability. When arranged starting from left to right, multiple wilds manage to create a combo of symbols. Two to five such wilds will offer between 10x and 7,500x the line bet. A very nice pair of revolvers is what the scatter symbol will show you. As the scatter, whenever this symbol makes an appearance the game will count how many of them are present, and will reward you when there are at least two. While for the minimum of two you get only the equivalent of the triggering bet, the prize goes up to 100x when all five are there. Scatter symbols are responsible for the start of this particular bonus game. With three or more Revolver symbols, you get this bonus game to start and you have to enter a showdown against the bandits. The next screen will show the Cowgirl from behind, with bad guys in the buildings around her. She will shoot at whatever targets you point to her, and you will get prizes from each one that is hit. Once you have five baddies shot, the bonus game ends. 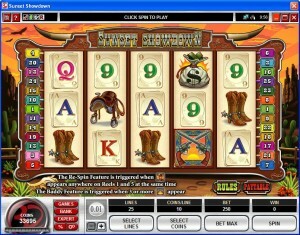 The slot has some free spins to give you as well, but they’re not the kind that you’re used to. You trigger them with the Cowgirl wild’s help, whenever this symbol is on the 1st and 5th reels. If that happens, these two reels turn wild, with the middle three reels spinning three times. The complete range of the bet goes from just $0.01, all the way up to $62.50. $0.01 is the smallest value of a coin, which would be enough to activate a single payline. 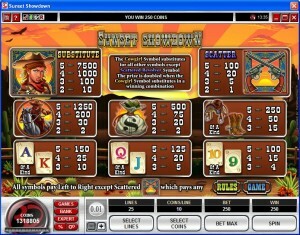 The maximum denomination is $0.25 and you can use up to 10 coins per line, for a line bet of $2.50. When the 25 lines are all active, the bets reach that $62.50 value that I mentioned before. You are promised a 7,500x jackpot, which would mean 75,000 coins in the best case scenario. The value would be $18,750 if the highest wager was used that round. I give the game a lot of points for the design, which is a lot of fun and which manages to make the playing cards look like they belong in this Wild West story. The themed symbols look even better, with money bags, revolvers, cowgirls and boots, all of them drawn with all the right details. 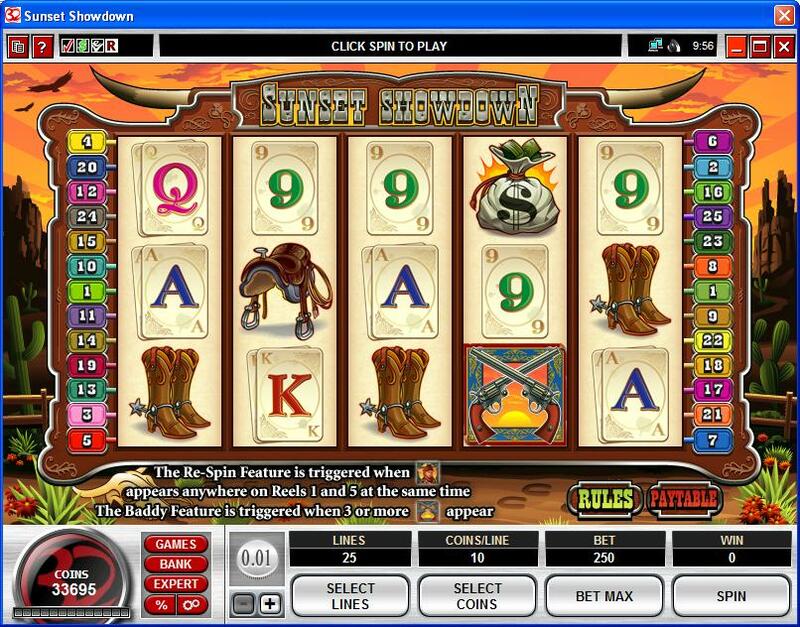 Symbols: Cowgirl (wild, 7,500x), Revolver (scatter, 100x bet), Cowboy (1,250x), Money Bag (500x), Saddle (250x), Boots (250x), Ace (150x), King (150x), Queen (125x), Jack (125x), 10 (125x) and 9 (125x). The design is one of the better ones in the Wild West category, and the presence of a Cowgirl in the main role instead of the more common Cowboy should make it a more palatable choice for girls everywhere. 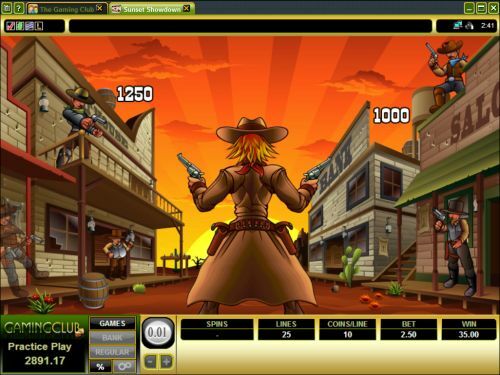 You will find Sunset Showdown at any online casino which chooses to use software from Microgaming, playable either for free or for real money.